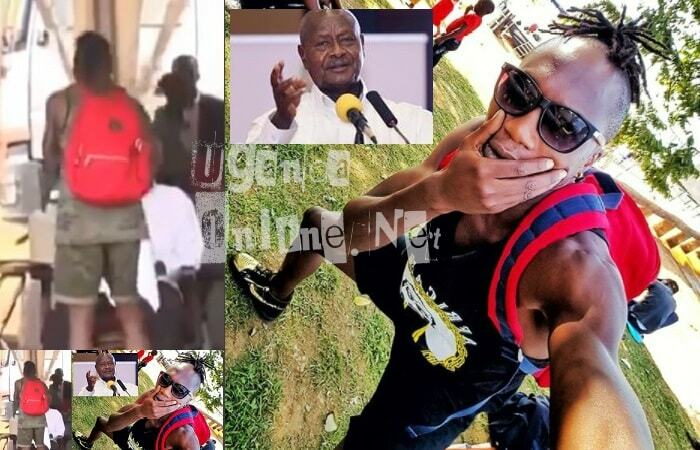 Team No Sleep's Roden Yusuf Kabako aka Roden Y performing at an NRM fete where he shook the hands of the President, but how he #DIDIT left a lot to be desired..
Presidential Guard Brigade soldiers were forced to take position as Kabako shook hands with the President. This was prompted by the way the TNS singer vigorously stamped his feet, which is his trademark, but the cops who had not seen perform before did not take chances for fear that he could do something out of the ordinary. The Number Emu singer is so full of energy while performing and this he normally does while on stages that are relatively small, but this time around, he had enough space to himself, he was in a field large enough to match like he normally does. "Kiri Kitya?? Nze Bampita Kabako, Majje ga kutaka...the General..Big Up yourself." Translated as "I'm Kabako, the one in charge of the infantry or foot soldiers, Big Up General, " Kabako told the President. "Nze bampita maki?..Majje Ga Kutaka before taking off as his 'Sitani Tonkema' song that he did with Sheebah Karungi played in the background. The President was in Kiboga during the NRM fete to celebrate the passing of the age limit bill to which was a good thing for a good number of Ugandans who had been left out of seeking the highest office.